A plaque commemorating Edmund Barton, Australia’s first Prime Minister, who was born in Glebe, marks the start of our walk. It is located on Arundel Street which was the original alignment of Parramatta Road. LOOKING AROUND: Arundel Street is the original alignment of Parramatta Road, for many years the principal road of the colony and the source of its food supply, first from Grose Farm, near where St Andrews College now stands and later from Experiment Farm and other farms near Parramatta. It was the last hill before entering Sydney Town. (The boundary stone set by Governor Bourke in 1833 was formerly at Bay Street, and now stands on the corner of Glebe Point Road.) In the 1880s it was decided to make a cutting next to Arundel Street, and re-route Parramatta Road through the cutting. In 1968, as a result of injuries to students, a footbridge was built across the cutting connecting Arundel Street to Sydney University. 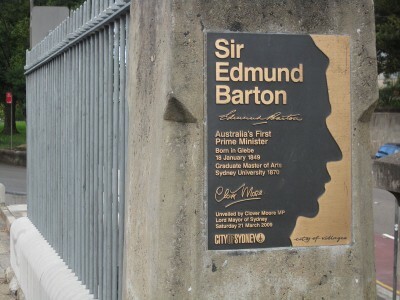 In 2007, after lengthy lobbying by the Glebe Society, the bridge was dedicated to the memory of Edmund Barton. Arundel Street originally had many coaching inns where carters could rest their horses and slake their thirst after the long ride from Parramatta. Kelly’s Stable, 25 Arundel St, looks modest from the street but once had a huge rear yard with a dozen stables originally used by carters and later by trotters at Harold Park. Note the stone retaining wall and steps, iron palisade fence and sandstone kerb along Parramatta Road. It is an excellent example of a retaining wall and stone course work. Barton was born in Glebe on 18th January 1849, and attended Fort Street School before studying Classics at the University of Sydney. He was a Fellow of the Senate for many years and represented Sydney University in NSW Parliament. Edmund Barton strongly supporting the push for the Federation of Australia’s states, and became our first Prime Minister, serving from 1901 to 1903. He is noteworthy for being one of the few Australian Prime Ministers to leave office at a time of his own choosing. He served as a High Court Judge from 1903 until his death in 1920, at which time he was described as ‘Australia’s noblest son’. Local history research suggests that his birthplace was at the corner of Glebe Point Road and Ferry Road.